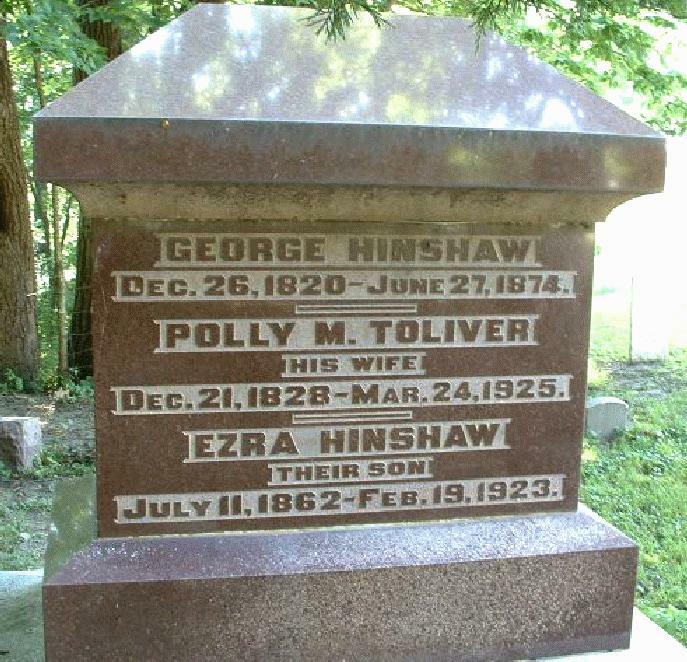 Hinshaw, Polly, head-of-household, age 71, born Dec 1828 in Illinois; father born in Indiana; mother born in North Carolina; widow; 11 children, 4 living; occupation: farmer; owned farm. Hinshaw, Ezra, son, age 37, born July 1862 in Illinois; father born in Tennessee; mother born in Illinois; single; occupation: farmer; owned farm. Covey, Lucinda, sister, age 69, born May 1831 in Illinois; father born in Indiana; mother born in North Carolina; widow; 9 children, 6 living. Byer, Jahu, boarder, age 20, born July 1879 in Germany; parents born in Germany; immigrated 1890; occupation: farm laborer. Hinshaw, Ezra, head-of-household, age 47, born in Illinois; father born in Tennessee; mother born in Illinois; single; occupation: farmer, general farm; owned farm. Hinshaw, Polly M., mother, age 81, born in Illinois; parents born in North Carolina; widow; 11 children, 4 living. Morningster [unclear], Ida M., servant, age 43, born in Ohio; parents born in Ohio; single; occupation: housekeeper, private family. Kowataki [unclear], Albert, hired man, age 58, born in Germany; parents born in Germany; immigrated 1873; single; occupation: farm laborer, working out. Hinshaw, Polly A. [sic], head-of-household, age 91, born in Illinois; parents born in North Carolina; widow. Hinshaw, Ezra, son, age 57, born in Illinois; father born in Tennessee; mother born in Illinois; single; farmer. Hinshaw, Deane J., [relationship unclear], age 28, born in Illinois; parents born in Illinois; single; farm laborer. Garet, Mae, housekeeper, age 24, born in Illinois; single; housekeeper, private home. Garet, Grace, housekeeper daughter, age 3 years 10 months, born in Illinois; single. Ezra Hinshaw died Feb 19 1923, Bloomington Township, McLean County, Illinois; buried Scogin Cemetery, McLean County, Illinois.2,11,12 Ezra is buried with his parents. 1880 census, Bloomington Township, McLean County, Illinois; roll T9-0230, ED 167, page 361C, line #36, dwelling #370, family #380. 1900 census, Bloomington Township, McLean County, Illinois; ED 79, page 72A, line #40, dwelling #143, family #146. 1910 census, Bloomington Township, McLean County, Illinois; ED 79, page 12B, line #64, dwelling #248, family #250. 1920 census, Bloomington Township, McLean County, Illinois; roll T625-386, ED 89, page 8B, line #73, dwelling #191, family #200. Ancestry Family Tree data "Duty Family Tree" posted by "dorionduty".